Actress and soprano Jeanette MacDonald captivated world-wide audiences and won millions of loyal devotees through her appearances on stage, screen, opera, concert, radio, recordings, and television. Among her many record-breaking films are such American classics as "The Merry Widow" and "Love Me Tonight" (with Maurice Chevalier); "Naughty Marietta", "Rose Marie", "Maytime", "Sweethearts", "The Girl of The Golden West" (all with Nelson Eddy); "San Francisco"(with Clark Gable); "Smilin' Through"(with Gene Raymond); and many many more. 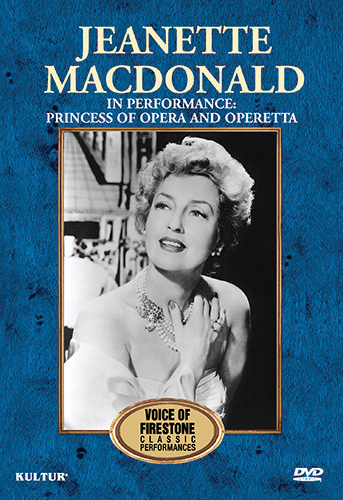 Though primarily remembered for her interpretations of the masterpieces of operetta, Jeanette MacDonald also sang in Grand Opera prompting Chicago's noted music critic, Claudia Cassidy, to dub her the "Princess of Opera." The Voice of Firestone telecast of November 13, 1950 marked the occasion of Miss MacDonald's television debut, and her only appearance on the Firestone series. 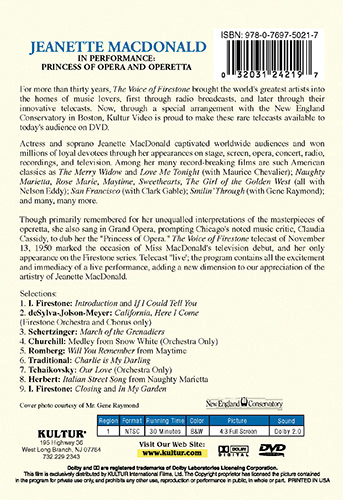 Telecast "live", the program contains all the excitement and immediacy of a live performance, adding a new dimension to our appreciation of the artistry of Jeanette MacDonald.